People shuffle, one behind another, through narrow doors into the stuffy cafeteria of Yuba City High School, taking their seats on rickety black fold-out chairs. Tiny water bottles sat on the table awaiting the guests who would soon take their seats. A microphone lay in the center. An American flag stands off to the side, another attempt to transform an otherwise typical high school into a suitable place for a California State Senate candidate debate. A distinguished man appeared first. With gray hair, a perfectly tailored suit, Jim Neilson made his way to his seat at the brown table. Behind him came Philip Kim, ever Neilson’s contrast, dressed in a simple plaid shirt and jeans. 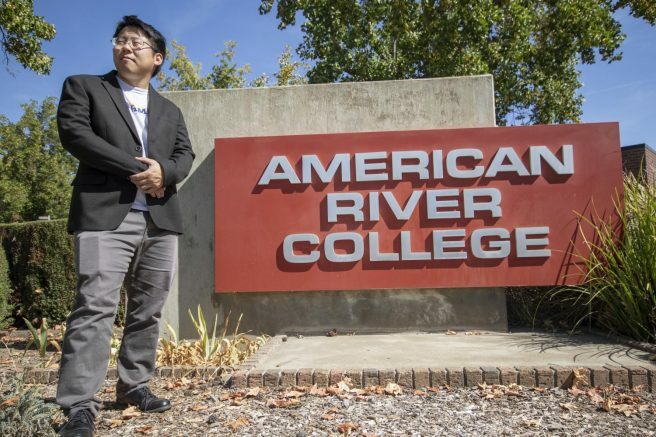 A former American River College student, Kim is running as the Democratic nominee for California’s State Senate against 4th district incumbent Nielsen. On Sept. 19, the two candidates participated in a debate held by Appeal-Democrat, a local news source for Sutter and Yuba counties, who also live streamed the event to their online viewers. Kim used the opportunity to publicly address his stances on free healthcare, implementing rent control and providing funding and free tuition for college students. California’s fourth State Senate district includes all of Yuba, Butte and Sutter counties, among others. It also covers parts of Sacramento and Placer counties, including Rancho Cordova, North Highlands, Citrus Heights, Carmichael and Roseville. Republican incumbent Nielsen has held the Senate position since 2013; previously he served on the Senate off and on since 1978. During the event, the panel asked questions about the two’s stances on several topics such as housing, immigration and their concerns about education, which Kim had a personal perspective on as a former ARC student. Before Kim found himself debating Nielsen for a seat on the California State Senate, he studied music at ARC. Kim belongs to two bands, the pop-punk band Red Hearts Bleed and the reggae band Vigilant Roots. Both are currently on hiatus while he campaigns. In high school, punk bands like Bad Religion and Anti-Flag, which had a strong stance in political affairs, resonated with Kim and sparked his interested in politics, but it wasn’t until the tragedy of 9/11 that Kim really got involved. “It wasn’t really until 9/11 happened when I was in college, that I got involved by protesting against the Iraq War. I saw how the public was manipulated to go to war,” Kim said. His involvement in political justice continued throughout his life and into his time attending community college. 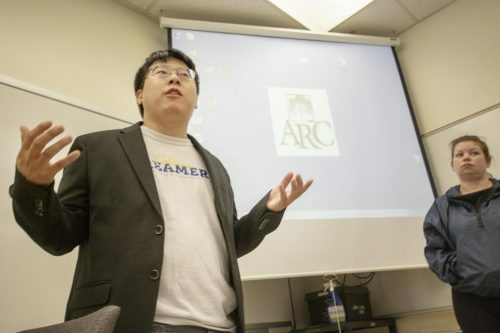 While attending ARC in 2015, Kim became involved with the Bernie Sanders campaign in Sacramento because he found that his political views aligned with Sanders. From there, Kim worked as a community organizer for the Medicare for All campaign, which has since become his day job when he’s not campaigning. Kim’s work paid off in the primary midterm election when he won over 42,000 votes, making him the top winning Democratic Socialists of America vote getter since 1996, despite running in a long shot, right leaning district. Now, running on a democratic socialist platform much like Sanders’, Kim says he believes in Medicare for All and strongly supports Senate Bill 562, or the Healthy California Act, in his venture for a senate position. SB562 would combine all forms of federal medical aid into one fund and the difference would be made up through taxes, according to Kim. “So it’s true that our taxes would go up but it would replace the huge insurance costs that right now individuals and employers are paying,” he said. Nielsen however, disagreed during the debate. “Single payer will bankrupt us. What did Obama-Care give us? Higher premiums, diminished care. It did not solve the problem,” he said. Instead, Nielsen said he believes California should focus more on making it easier for nurses and doctors to work. Many questions asked during the debate touched on the recurring topics of homelessness, rising rent and housing costs in California. Kim and Nielsen offered different opinions on what role the government should play in California’s housing crisis. The Democratic nominee strongly advocates for Proposition 10, which would repeal the Costa-Hawkins Rental Housing Act. Enacted in 1995, it places restrictions on local governments and cities to pass certain types of rent control. With the Costa-Hawkins repealed, Kim said he feels that it would give power to local governments to handle the housing crisis in their cities. Nielsen’s views contrast Kim’s in that he believes that government regulation itself is at fault for the skyrocketing rent and housing costs. When it came to the topic of education, Kim suggested that full funding and adopting the European model of free college is the answer, while Nielsen referenced his previous work in education as a reason why he is the best candidate for community college students. Over 44 million Americans hold nearly $1.5 trillion in student debt, according to CNBC. As a former student himself, Kim witnessed the skyrocketing increase of student debt with his friends. “The student debt crisis is getting pretty crazy. A lot of my friends have tens of thousands of dollars worth of debt, which they’re struggling to pay off because there’s a lack of decent paying jobs also,” Kim said. The panel asked the candidates about their concerns regarding grade schools and higher education at the debate. Nielsen said that public education needs to be held accountable for low test scores, not more money, and that reducing testing was not the answer. One thing both candidates agree on on is that more young people should be involved in politics, both encourage young people to take an interest in their government so they can make a difference for themselves. “I think it’s super important for young people to get involved, otherwise these wealthy corporate interests are making decisions for us and they don’t really care about the people, they care about making a profit,” Kim said. Nielsen encouraged young people to consider many sides of an argument and the authenticity of a candidate. Kim’s is running for senate as a part of what he calls “the revolution,” a fight for reform of the government, society and quality of life in the United States. After ‘the revolution’, Kim said he’d like to get back to the music he had supported at ARC. “In a more just society I would be playing more music, and maybe not even being involved in politics,” he said, but until then for Kim, there’s work to be done. Be the first to comment on "Former ARC student runs for California State Senate"